Well I started a new cycle of chemotherapy today (Wednesday) and it is really knocking me for a loop . . . so it is a very good thing that I have a battle that I can fight at my own pace. Both Ross and Murdock had already sent me their Orders of March some days ago . . . the holdup has been my getting the terrain set up . . . but it is now finished. The basic scenario is the attempt by the Duchy of Stagonia (which lost the battle of the Crossroads) to attempt to prevent the army of the Duchy of Alpia from forcing their way through the Bellevue Hills into the rich wine valleys of Stagonia's southern holdings. 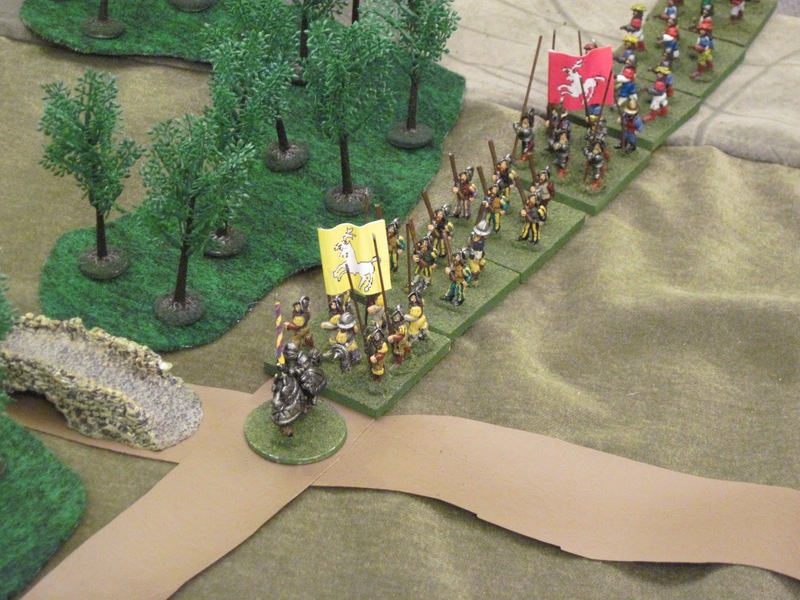 I've posted the "Opening Moves" for this battle on my "The Alpian Wars" blog. It presents General Murdeau with a decision . . . He doesn't know the strength of the Alpian columns (there appear to be two) but he suspects that they (in total) will outnumber his forces (even though they've been reinforced since the Crossroads battle). He has a number of options (as described on the blog link above . . . what would you do in his place? For those curious about how the chemo is hitting me. I've spent the last couple of weeks taking a battery of test and scans of my heart and lungs to determine if my "shortness of breath" has to do with them. Fortunately the doctor said that all of these were good . . . no heart or lung problems. Then when I started this chemo cycle within a few hours I was huffing and puffing again . . . so, just as I thought all along, my shortness of breath is from the chemo and not an underlying problem. So this is all good news . . . except that the extreme fatigue gets in the way of gaming. Best of luck with your treatment. I found great solace in my miniature hobby when recovering from a pair of strokes and hope you can find some relief in it also as you go through your treatment regimen and recovery. Keep going Jeff,you'll get there! Hope that the fatigue abates and allows gaming soon.